Macbeth is one of Shakespeare’s most thrilling—and oft-quoted—plays, and it’s been turned into some really insane movies over the years. It’s a classic story of a good man who gets tempted with a promise of greatness. But the new film version delivers on the horror, but not on that operatic arc. Shakespeare seldom featured out-and-out supernatural themes in his work—The Tempest is a major exception—but the key to Macbeth is these three witches who tempt Macbeth with their prophecies. When the play (and movie) begins, Macbeth is loyal to King Duncan of Scotland, and has in fact won a great victory over some rebels against the King. But then the witches predict, accurately, that Macbeth will soon be named Thane of Cawdor, on top of which they promise that he will be king himself. This, plus the ambitious urging of Lady Macbeth, is enough to tempt Macbeth to take matters into his own hands. 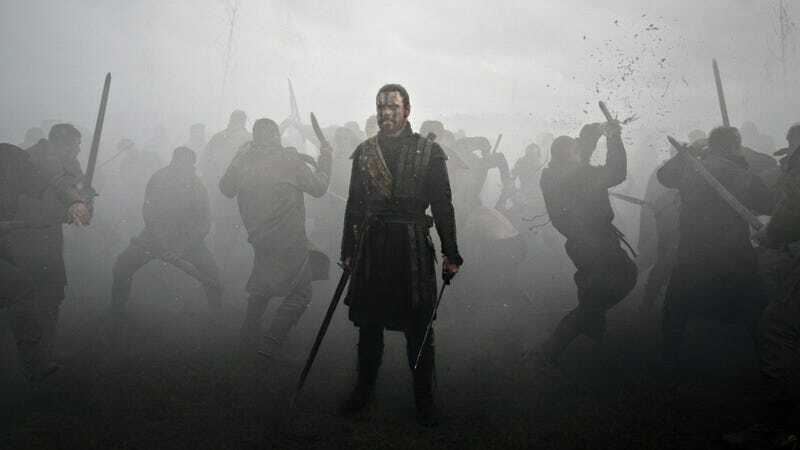 The new film version, directed by Justin Kurzel, has a great cast—Michael Fassbender plays Macbeth, Marion Cotillard is Lady Macbeth, and Paddy Considine as Banquo. And as this trailer conveys, this new Macbeth film has some absolutely beautiful imagery—the battle scenes at the beginning and end are very stylized, in a mixture of Japanese samurai epics and Zack Snyder’s superhero films. At various points, Macbeth seems to stand still in the midst of whirling swordplay, and the blood flies in all directions. The landscape of Scotland provides a series of beautiful long shots, too, and it is by turns lyrical and misty. The biggest innovation this new Macbeth film has is that it subtly recasts Macbeth’s overweening ambition as a product of post-war trauma. Macbeth has gone through unimaginable horrors defending King Duncan, and when he hears that he’s destined for the throne, something just sort of snaps in him. We pick this up in Fassbender’s performance, which is weary from the very first moment of the film, and also from the film’s overall aesthetic, which is dirty and wounded. Everybody is covered with grime, blood, grease, and random effluvia, and nothing in this version of medieval Scotland looks particularly clean or pleasant. Macbeth, and everybody around him, is damaged and messed up after the long civil war, which only makes it more insane that Macbeth chooses to start the madness all over again. And while I’m praising the film’s aesthetic, the witches are suitably creepy, emerging out of the blasted landscape on the heels of battle. There’s no encounter in the deep woods or the middle of a long journey—rather, the witches show up on the edge of the battlefield like vultures. They lurk in the distance: sad, malevolent observers. So there’s a lot to admire about this film’s aesthetic, and its approach to the tragic material. Which only makes it sadder to report that this film, in the end, did not work for me. Fassbender and the rest of the cast deliver every single line in the same low monotone, like they’re already so exhausted and depressed that they can’t quite rouse themselves to any passion. Neither Macbeth nor his wife ever seems excited about the prospect of taking the throne, nor is their descent into madness particularly energetic later in the film. This weirdly, monotonously grim style of performance seems to be a consequence of the choice to emphasize the trauma of war in setting up Macbeth’s arc at the beginning of the film—but it also seems like a stylistic choice, based on the idea that the way to make Shakespeare more modern or accessible is to keep the performances incredibly subdued and low. But the thing is, Macbeth is a play about passion and people going too far. Without Macbeth’s thirst for power and his wife’s overreaching, the story simply doesn’t work. And without the highs and lows—both emotional and psychological—the story of Macbeth’s fall from grace seems almost pointless. The tone is set at the very beginning, when a minor character is telling King Duncan about their victory over the rebels—a jubilant speech, about a valiant campaign against rebels—but it’s delivered in a grinding, miserable tone. To add to the movie’s depressive, low-energy tone, the film’s soundtrack consist of a few string instruments playing the same desparing notes over and over, for most of its running time. It’s somewhere between a Ken Burns documentary and a horror movie. This tone, combined with Fassbender’s smeary-eyed appearance throughout, leave you feeling a bit bludgeoned with melancholy. Oh, and Fassbender can’t seem to make up his mind whether to do a Scottish accent. He has it from time to time, but it vanishes during some scenes or even halfway through the scene at times. The thing is, some of the greatest filmic versions of Macbeth have been the ones that took the most liberty. For example, Throne of Blood is a totally gorgeous samurai epic that captures the intense feel of Shakespeare while moving to another setting. And Scotland, PA reimagines Macbeth as a murder mystery in present-day Pennsylvania, with Christopher Walken as a creepy cop. Plus there’s Maqbool, Men of Respect and Joe MacBeth, which I haven’t seen but all of which sound pretty great. I’m not saying you can’t do a great film of Macbeth straight-up, keeping the Scottish setting and original language and everything—but maybe in that case, you would need to commit to being a bit operatic. You can’t deliver the “out, out, damn spot” speech in a low breathy monotone, is what I’m saying. Director Kurzel has accurately picked up on the fact that Macbeth is one of the most horror-tinged of Shakespeare’s plays. Those witches never have any motive for screwing with Macbeth and Banquo, other than just being kind of evil, and almost everybody winds up being various kinds of toast as a result. It’s a bloody great mess, in which you can almost believe the blood on Macbeth’s hands really would be enough to turn the ocean pink. But all this film proves is that this particular horror stems from people’s willingness to do terrible things in the name of ambition—and that, in turn, has to come from high emotion, not just a weary acquiescence.